L: 64" x W: 20" x H: 44"
Somerset Bedroom Dresser This breathtaking Somerset bedroom dresser in alabaster white will adorn your bedroom with the quaint look and classic presence only timeless white furniture can offer. Handsome fired-nickel hardware adds just the right finishing touch to complete the dresser's charming design. This breathtaking Somerset bedroom dresser in alabaster white will adorn your bedroom with the quaint look and classic presence only timeless white furniture can offer. Handsome fired-nickel hardware adds just the right finishing touch to complete the dresser's charming design. This piece is advertised as having dovetail joints. There are no dovetail joints anywhere on this piece. The back of the dresser already warped and the entire piece is held together by glue. Drawers do not slide smoothly, and I cannot place any heavy clothing because bottoms are not study. If this lasts more than a couple of years I will be lucky. If I had seen this in person, no way I would have purchased it. This was not cheap, but that is the way it is made. I will never purchase anything from Raymour and Flanigan again. The piece looks nice..but the drawers do not slide in and out like quality drawers. For the price it should be better built. Don't get this is you want high quality sturdy furniture. I purchased this dresser, along with the coordinating mirror, full bed, and nightstand for my 5 year old daughter's room and I could not be happier with it. The furniture is extremely heavy and well made, and quite honestly, looks a lot more expensive than what it is. I decorated the room in shades of pale gray, aqua and pink and with this set makes it look very sophisticated. I get so many compliments on it. The smaller drawers on the dresser are great for hair accessories and other misc items like tights, swimsuits and jewelry. Also, I just want to say that the drawers open and close smoothly on both the dresser and nightstand, something that I tested upon delivery after reading so many negative reviews. Overall, I am really happy with my purchase and would definitely recommend it. Love this dresser. Very well made and ample storage space. Very classy and the color is perfect. Generally like the product. The drawers in the display model we not working well, but the salesman advised that there would be no problem with the delivered model, as the display model had been out for years. Unfortunately, some of the drawers are not working well, and will require a phone call to the store. Seems that these should have been carefully checked by the store prior to shipping/delivery. Our bedroom is our favorite room in the house thanks to the Somerset collection. It adds a crisp cleaning feeling but the white is soft at the same time. The drawers are deep and sturdy. I ADORE this set! Love being able to put so many different things in one chest! Perfect piece if you dont mind 6 small drawers. Very pretty hardware. 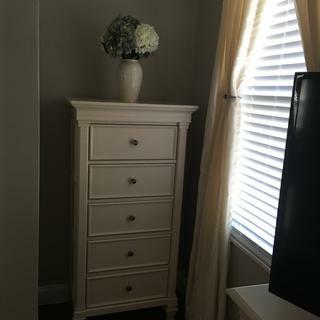 I really love this Dresser.....I love the color it's easy on the eyes and it has enough storage for separated clothing pants in one drawer shirts in the next that's how i do it..I would definitely recommend this product! First piece for my dream bedroom! I put the collection on lay-away and opted to bring this piece home first. Having no bedroom furniture prior to delivery, I was able to store a great amount of my clothing in it! Looking forward to getting the rest of the set in a few weeks! Sturdy & well made, it's also incredibly attractive! My "beach getaway" is going to be perfect! Not the best quality item when I saw it on the floor but after it arrived I knew exactly why I had went ahead and ordered it. It blends perfectly well with my beachy bedroom theme.Love the height! Lots of drawers but not meant for bulky items like sweaters or jeans. I'm still satisfied with my purchase. Great piece, the entire set is huge. I think it is very well made. I have had no problems with drawers and doors. The only downside, I wish that it had some long drawers instead of a bunch of small drawers. Overall I am happy with my purchase. This is a beautiful and spacious piece. Looks great with the other pieces I have purchased from this collection. Thank you. I love the dresser! Has lots of drawers and plenty of space. The entire experience, from the sales person introducing himself to assisting us in making our decision and other details such as pricing,shipping and delivery, was a good one. I have bought many pieces of furniture and would glady recommend to any/all of my friends. I LOVE my new dresser! It's large enough that I was able to get rid of the chest of drawers I had before and condense everything into my new dresser. And it's beautiful! Looks so good in my bedroom! Love it, love the way it sits so high and you can vacuum underneath it. love all the drawers. Very pretty. Since we were looking for something a little country, we purchased this bedroom set for our master bedroom. So for, we have received a lot of compliments from friends and family. Looks expensive which is perfect for my caviar taste and Kool-Aid budget. Such a nice, unique piece of furniture! Well made and substantial. Very satisfied. Love this new dresser. It’s beautiful and unique. 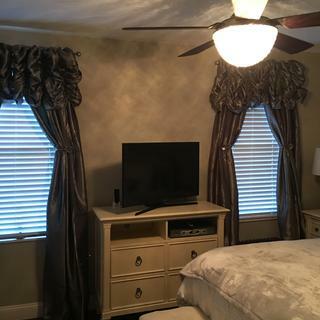 Complements our newly renovated bedroom. went to the store Weds, wrote up the purchase, paid over the phone on Saturday and it was delivered Monday. It is beautiful and large. Perfect for our needs.It is has a high quality feel. We love it!!! Beginning with the friendly salesman and store manager to an easy delivery, everything went great. The furniture is beautiful. This is our fourth purchase with Raymour & Flanigan and we've never been disappointed. I actually ordered this for my living room to put my TV on. It is much nicer than I even expected it to be! I have purchased many items through Raymour & Flanigan and this piece is by far one of my favorites. Very well made with loads of storage! Beautiful and classy looking. Very happy with it. It is a large dresser, so make sure to measure your room. We almost didn't fit it in. Ample storage, well made, looks great. Well made and lots of storage space. The color is pretty, although the paint can chip easily so you have to be careful when placing things on it. Overall, we really love this set! Love the set but drawers are very small!! I purchased this whole bedroom set. I definitely love the looks of it but the drawers are so small I can only fit a few pieces of clothing in each drawer...and I'm a small female. I do think the prices for the end tables are insane too. I really like this dresser! The light colors really brighten up the room. The only downside is that the drawers do not slide and are hard to open and close. I love the personality and looks of this dresser, but again, just like the chifforobe there is not alot of room in the drawers! The are too small! I am of small frame my clothes are not large and they still don't fit. Heaven forbid if a person wearing a Large had to get their clothes in them! The drawers are very deceiving! How do I remove the dresser drawers? What is the Depth of dresser drawers? BEST ANSWER: The depth of the side and center drawers are 4". The two bottom drawers are 6" deep. how do the drawers come out are you kidding me? pulling straight out does not work. BEST ANSWER: The easiest way to pull out the drawers is to place thumbs on the face of the dresser and pull each side with an equal amount of force. There is a rubber stopper at the bottom of the drawer. Once the rubber stopper is pulled out the drawer will easily slide out. If you have any further questions please contact the Customer Care Center at 866-383-4484 option 3. Are the drawers wood on wood or do they have tracks? BEST ANSWER: The Somerset dresser has wood-on-wood drawer guides. Wood-on-wood drawer guides allow the drawers to open and close smoothly and quietly. can the feet and center piece be removed? so dresser sits flat on floor. BEST ANSWER: It would not be recommended to remove the feet so dresser sits flat on the floor. I lost a knob while moving. How can I get a replacement? BEST ANSWER: For replacement knobs, please contact Customer Care at 866-383-4484, option 2. The chemical smell is unbearable. I want to return the set but I know my wife won't do it. What can be done to eliminate the odor? I have some of the drawers out and the windows open, but it's cold weather here, I need a better solution. BEST ANSWER: I'm terribly sorry you are experiencing this. Typically, any odors from the manufacturing process will dissipate over time. However, please contact Customer Care at 866-383-4484 option 2 and we would be happy to look into this for you. How do I care for this wood ? Is there any product I can use on this furniture ? BEST ANSWER: The manufacturer recommends: * Wipe with a damp cloth. * Dry thoroughly with a clean, dry cloth. * All spills should be cleaned up immediately. What is the size and the depth of the dresser drawer? BEST ANSWER: The side drawers are 11" L X 13" W X 4" H. The center drawers are 23" L X 15" W X 4" H. The bottom drawers are 25" L X 14.5" W X 6" H.
Where is this set made? BEST ANSWER: Magnussen Home sources their designs from only the finest home furnishings manufacturers, many in the Far East and Central America. Their technologically advanced factories facilitate quick shipment as well as great value and gorgeous furnishings. The Somerset Collection is made in Vietnam. BEST ANSWER: Empty the drawer and firmly pull the drawer straight out. 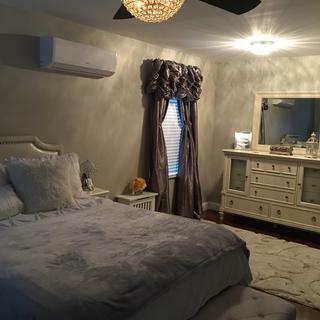 Is this bedroom set made in the U.S.? I tested the drawers at a Raymour & Flanigan showroom, and they do not slide smoothly. Is that a defect with the floor piece, or typical for the dresser? BEST ANSWER: The drawers on a brand new piece will work smoothly. The floor models are often subject to excessive usage that can cause issues over time. what materials is this furniture made with?|specifically the paint. BEST ANSWER: This is painted white then finished with a clear stain topcoat. BEST ANSWER: Yes, this is real wood. Can the drawers be removed from the dresser and then put back in? BEST ANSWER: Yes, the drawers are removable. Does this bed frame come in a Full Size? BEST ANSWER: I'm sorry. The Somerset collection is not available in a full size. I need to know the color of the paint for this dresser and where I can purchase it. I have a few nicks that I need to tend to. BEST ANSWER: Please contact Customer Care at 866-383-4484 option 2 for assistance. They will best be able to handle this service related concern. BEST ANSWER: The dresser weighs 217.80 lbs. 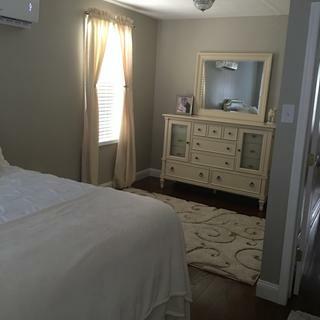 Does the mirror that goes with this dresser need to be hung on the wall or does it go freestanding on the dresser with a support piece that attaches the mirror to the dresser?? BEST ANSWER: The Somerset mirror will attach to the back of the dresser with a bracket. This assembly will be handled by our delivery team as part of our delivery service. Does this come in another color of finish? BEST ANSWER: No special orders are available for this set. BEST ANSWER: This set is manufactured by Magnussen Home Furnishings, Inc.